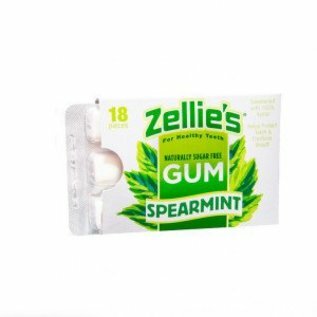 Zellie’s gum is sweetened with 100% all natural, tooth-friendly xylitol and each piece of gum contains 1 gram of xylitol. Studies show 6 to 10 grams of xylitol daily, in frequent small doses, helps prevent damage from dental plaque, dry mouth and acidity. Eat 1-2 pieces of Zellie's gum directly after meals, snacks and beverages to help neutralize acidity for a cleaner, healthier mouth. Two 100 count jars are approximately a 1-month supply for one person. Xylitol, Gum Base, Natural Flavors, Gum Arabic** (thickener), Sunflower Lecithin, Carnauba Wax** (natural glazing agent).